Roblox CEO David Baszucki took some time out of his day to answer some questions about the new VR features for Roblox, as well as demonstrate how the new virtual reality support works in real time for CinemaBlend. Roblox, boasting more than 20 million users a month, has officially joined the VR race and that's just the start. According to Baszucki, the team have been working on the implementation of VR support for Roblox for the past six months, gearing up for the release of the Oculus Rift and HTC Vive. This is pretty big news for the online play-set that enables gamers to create their own games and share them with the world. The support for the HMDs allows for immersive 1:1 head-tracking so that as players look around in real life, their in-game character will look around as well. However, just because the game supports VR doesn't mean it has to stay in first-person. 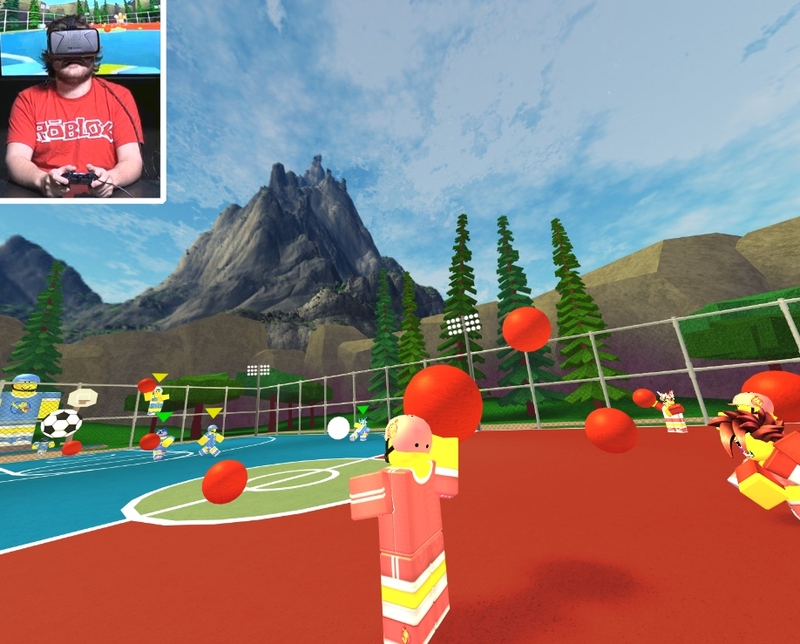 Kyle, one of the VR staff working with the team on the implementation of this new feature for Roblox, offered a first-hand look at the game running on the Rift in both first-person and third-person view. Absolutely. Our vision is that Roblox is ultimately going to be the place where everyone comes with their friends to explore, experience role-play, and share immersive experiences. And we want Roblox to be everywhere. So it's only a matter of time, really, where platforms continue to [adopt] this vision of ours where Roblox will be accessible wherever you may be. So it sounds like Roblox doesn't want to be quick to leave anyone out when it comes to VR development. They've tried to design and optimize Roblox so that it doesn't give users an "aggressive" virtual reality experience. They mentioned during the live demonstration that while there are some driving and Super Monkey Ball-style mini-games available—as well as some first-person shooter games that are very popular with many gamers—the main focus was making a more socially interactive and immersive experience for casual gamers with the implementation of VR. Baszucki noted that the social experiences could be the driving factors to make VR boom in the market, just the same as the social features helped garner Roblox millions of users each month. But don't take that as a sign that you can't make some intense games to take advantage of the immersive possibilities that come with a virtual reality headset. In one demonstration, the new smooth terrain creation toolkit took certain stages and Kyle equipped a hand-glider and began flying seamlessly through canyons, past small hills and over riverbeds in what looked like a visually stunning recreation of an area like the Grand Canyon. Some of the VR demonstrations were compiled into a video that you can check out below to get an idea of what the headset tracking and reaction timing is like in Roblox. The whole point was to basically showcase how a creation kit like Roblox could be used to simulate a thrilling tourist-style experience right from the comfort of your computer chair. Quite naturally, after the developers had announced and released Roblox on the Xbox One—where it became one of the top most downloaded free games on Microsoft's home console—the most common question that most people have at this point is if the console endeavors would include porting the title over to the PlayStation 4? This line of thought rings especially potent at the moment, since the PS4 will be getting PlayStation VR support later this year in October. According to Baszucki, they haven't made any official announcements about the possible porting of their game-making toolkit from Xbox to PlayStation, but they definitely have an eye on the PlayStation VR and it's most certainly not ruled out. It was also mentioned that they've already garnered more than a million players on the Xbox One, and they expect to see those numbers continue to grow for the software on Microsoft's platform. Expanding upward and outward to Nintendo and PlayStation only seems logical, especially with the PlayStation VR on the horizon. Of course, one of the main concerns for some players is controller accessibility. Playing a game on PC is not always the same as playing it on console. However, during the demo, Kyle showcased Roblox running on the Rift with an Xbox controller, demonstrating how convenient it is to move around in the 3D space without requiring a complex series of button combinations. They also spent time optimizing the movement and peripheral controls to easily support the HTC Vive and Oculus Rift's 3D positional controllers. The software compatibility for those controllers aren't implemented yet, but it will be coming soon. Baszucki talked about using those wireless controllers to play around with certain things within the game world, such as users making pizza in a pizza shop, or manually driving a truck to deliver those pizzas. Of course, what good is having all these cool virtual reality features if no one is going to use them? According to Baszucki, they already have an established community of Roblox users looking forward to building new games and worlds based around VR support. It was also mentioned that the software is still scaled for low-end PCs, so you won't need a top of the line rig to play Roblox with a VR headset. And just like with the standard Roblox games, Baszucki mentions that content creators will still be able to monetize their projects and bring them to life. I did inquire as to whether or not Baszucki thinks that the price of these VR games could be higher than the other standard games, but he thinks that pricing and monetization of VR experiences within the game world will relatively stay the same for their base, which extends to more than 300,000 creators. The VR capabilities, Oculus Rift support and VR tools offered in Roblox are currently available right now. Later on the developers plan on adding in HTC Vive and wireless 3D controller support. You can learn more by visiting the game's official website.